Next week Berkeley Lab will debut a newly redesigned main website that will better connect those who seek information with those who publish it. The changes begin with the Lab's home page, which in an average month is viewed some 200,000 times. The new site features a revised and streamlined set of links. Moreover, pages linked to the home page are unified in their design, all featuring a navigation banner that includes links to the Lab search engine, the A-Z Index, the phone book, and a comments form. The Lab's main website, from which more than 1.5 million text and graphic files are downloaded each month, is a vital communication tool for the Laboratory, said Ron Kolb, head of the Public Information Department. 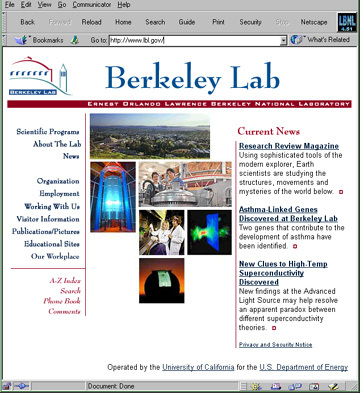 "Berkeley Lab was one of the first institutions in the country to develop a comprehensive website back in 1993," Kolb said. "Since that time the Laboratory home page and its links have evolved continuously, but not systematically. Given the growing importance of the web as an essential communications vehicle to internal and external audiences, it seemed like the right time to reevaluate our site and make sure that it provides the maximum in service and benefit to the public as well as to our employees. "The redesign of the home page and directly related pages," Kolb continued, "ensures that our website is attractive and accessible, simple to navigate, with a clear hierarchy of links and an overall look and feel reflective of the scientific mission that drives the Laboratory's existence." Jeffery Kahn, the Public Information Department's electronic media coordinator who led the redesign effort, said the upgrade has proceeded in stages. Phase one was the acquisition of the Infoseek search engine which, for the first time, made it possible to find files spread out on the more than 300 servers at the Lab. Phase two was the development of "My LBNL" (my.lbl.gov), a personalized intranet site by the Computing Infrastructure Support and the Public Information departments. The main website redesign project is the latest phase of the upgrade, according to Kahn. 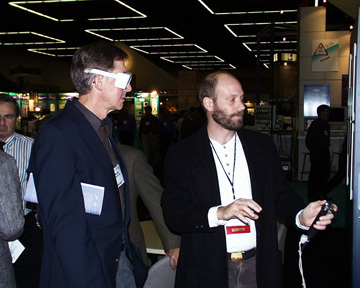 Prior to going online, the redesigned main website underwent an extensive review process that included input by the Public Information Department, the Lab's Web Publishers Group, the Computing and Communications Services Advisory Committee (CSAC), Lab Director Charles V. Shank and the Director's Action Committee (DAC). Subsequent to review by DAC, website managers throughout the Laboratory have been asked to implement a modest set of labwide design standards intended to make it easier for users to find online information and to ensure that this information is readily identifiable as being published by Berkeley Lab. Links to the Lab phone book and the A-Z Index. 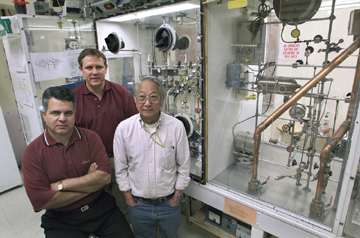 transuranium elements at Berkeley Lab. "In 57 years of scientific research, I have sometimes come up short with answers, but I've never run out of questions." That's what Berkeley Lab's Albert Ghiorso, a man who has participated in the discovery of more atomic elements than any living person, told the students and teachers who packed the Bldg. 50 auditorium on Nov. 4 for the Elements Week Symposium. November is the month in which Bay Area science teachers customarily teach their students the periodic table of atomic elements. This year, these classes got a big-time boost from the Lab's Center for Science and Engineering Education (CSEE) which sponsored "Elements Week" the week of Nov. 1. The highlight of the week-long celebration of the elements on the periodic table was the Nov. 4 symposium, which drew more than 500 students and teachers from high schools, middle schools, and even community colleges in the East Bay, San Francisco and San Jose areas. One class came from as far away as Stockton. The symposium events began with a 30-minute reception at 4:00 p.m. and a showing of "The Joy of Discovery" video about Berkeley Lab science. Following the reception, community college and high school students and teachers gathered in the Bldg. 50 auditorium for an hour-long discussion that featured, in addition to Ghiorso, Ken Gregorich and Victor Ninov, members of the research team that discovered elements 118 and 116, the newest additions to the periodic table. A parallel discussion for middle school students was held in the cafeteria with speaker Carola Laue, another member of the 118 and 116 discovery team. Even with two parallel talks, there was an overflow of attendees. More than 100 late arrivals were directed to Perseverance Hall for talks and demonstrations given by Howard Matis of the Nuclear Science Division and Susana Deustua of the Supernova Cosmology Project. "The numbers far exceeded our expectations for this first symposium, and showed the high level of interest educators have in Berkeley Laboratory scientists and science breakthroughs," said Rollie Otto, director of the Center for Science and Engineering Education. "We wanted students to know that the periodic table is not just about discoveries made a hundred years ago -- it's an exciting place of science with new elements still being found," said Eileen Engel, the pre-college coordinator for CSEE and director for education programs at the Chabot Observatory and Science Center. 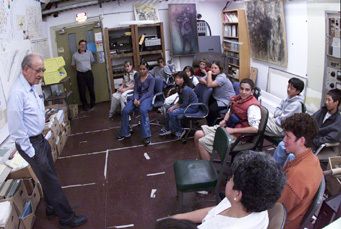 Before the symposium began, Ghiorso met in his laboratory with a group of students and their teacher from the Alice Fong Middle School of San Francisco. After his talk he also spoke for 30 minutes to a full crowd in the cafeteria. And following a buffet dinner, Ghiorso, along with other members of the elements 118 and 116 discovery team, autographed copies of the periodic table which had been passed out during the festivities. As part of Elements Week, CSEE maintained a special website through which students could direct questions to Ghiorso and other scientists who search for new elements. One student asked Ghiorso for an "unusual fact about copper that my AP chemistry teacher wouldn't even know." Ghiorso replied with a story about World War II when plutonium was part of the highly classified Manhattan project and he and the late Nobel laureate Glenn Seaborg used the word "copper" as code for "plutonium" to discuss their work in public places. "The trick question to ask your teacher would be under what circumstances was plutonium at one time considered to have the same chemistry as copper?" Ghiorso wrote. During his talk at the symposium, Gregorich was asked what is the limit to the number of elements on the periodic table. His answer: "Thirty years ago, the answer might have been element 106. Today the correct answer is `nobody knows.'" An international collaboration of radiochemists, including researchers from Berkeley Lab, has used a cyclotron at the Paul Scherrer Institute (PSI) in Bern, Switzerland, to determine the volatility of bohrium, element 107 -- the heaviest element yet whose chemistry has been successfully investigated. An isotope of bohrium with a relatively long half-life of about 15 seconds was crucial to the research; it was detected earlier this year at the 88-Inch Cyclotron by a team of resear-chers from Berkeley Lab's Nuclear Science Division and UC Berkeley, working with visitors from PSI and the University of Bern. "Elements beyond 100 are made an atom at a time, with very low production rates, and have very short half lives," says Darleane C. Hoffman, a longtime collaborator with Gäggeler's team and coleader of the group which identified bohrium 267. Hoffman is a member of the Nuclear Science Division and a professor of chemistry at UC Berkeley. "The chemistry of the heavy elements requires separations that come to equilibrium very rapidly, and these must be valid on an atom-by-atom basis," she says. These atoms are created in the laboratory by bombarding heavy target nuclei with an accelerated beam of projectile ions. The nuclei of interest, which are created by the evaporation of a few neutrons, are only a very small fraction of the huge number of reaction products produced. In the first two weeks of the Swiss volatility experiment, only four bohrium nuclei were detected. The Swiss researchers used a beam of neon 22 to bombard a target of berkelium 249, which has a half-life of 320 days. The targets were prepared at Berkeley Lab from material furnished by the Department of Energy through its Transplutonium Element Production Program at Oak Ridge National Laboratory. Immediately after bombardment, the reaction products were swept into an automated isothermal system developed by Gäggeler and his colleagues. There, they formed molecules in oxygen-containing hydrogen chloride gas; these were passed through a chromatography column. The four bohrium atoms were found only after they had passed through the column, when the oxychloride molecules containing them were deposited on a rotating detector that carried each small sample under a set of radiation detectors. Bohrium 267 was unambiguously identified by the pattern of its alpha decay -- first to an isotope of element 105 with mass number 263 (called dubnium elsewhere and known as hahnium to its Berkeley Lab discoverers), then to lawrencium 259, and subsequently to mendelevium 255. In the isothermal system, the more volatile species pass through the chromatography column at lower temperatures; the bohrium 267 compound was shown to be volatile at 180 degrees Celsius. Continuing experiments will determine whether bohrium is also volatile at lower temperatures or whether the atom's electronic structure is so distorted by its highly-charged, heavy nucleus that its chemical properties deviate unexpectedly from those of other members of its periodic-table group. Besides Hoffman, Berkeley Lab researchers who collaborated in the identification of bohrium 267 include senior scientists Kenneth Gregorich and Heino Nitsche, postdoctoral fellows Uwe Kirbach and Carola Laue, and graduate students Joshua Patin, Dan Strellis, and Philip Wilk. In addition to PSI, the University of Bern, Berkeley Lab, and UC Berkeley, institutions involved in the volatility experiment included the Flerov Laboratory in Russia, the Forschung-zentrum Rossendorf, Gesellschaft für Schwerionenforschung (GSI), and the Technical University of Dresden in Germany, and the Japan Atomic Energy Research Institute. How is it possible to split an atom and see what lies inside? Whatever happened to elements #113, #115 and #117? How did you discover the elements in the first place? We know you can fuse two atoms together...but can you fuse three atoms together? Have you and your group considered the name(s) of the elements you have recently discovered? Would the discovery of a new element help us get a better grasp at the world around us? Can these elements make a new substance unknown to this world? Nucleic acids embrace many more kinds of molecules than just giant strands of DNA and RNA, and several forms have shown promise for therapy. "Nucleic acids and their constituents have been studied for several years as potential therapeutic agents," says Manouchehr Saljoughian of the National Tritium Labelling Facility (NTLF). "The most advanced of these are just reaching the clinical trial stage." Possible agencies include aptamers, sequences of DNA and RNA that bind to a variety of specific molecules with roles in controlling gene expression in diseases such as cancer or atherosclerosis and in other biological functions; and antisense agents, groups of nucleotides that bind to a strand of messenger RNA and disrupt the passage of genetic information. Nucleotides are the structural subunits of DNA and RNA molecules, consisting of sugar-phosphate backbones attached to purine or pyrimidine bases. Recently Saljoughian and his NTLF colleagues Hiromi Morimoto and Philip G. Williams have found a new way of tagging nucleotides for biochemical studies. One of the best ways to study how a chemical is distributed and altered in the body is to label it with a trace amount of a radioactive element. Tritium is the radioactive isotope of hydrogen, with two neutrons in its nucleus; since hydrogen is ubiquitous in living tissues, in principle tritium can be used to label an almost limitless range of biological molecules. In practice, the job is not so easy. For example, nucleotides whose phosphate-backbone segments have been labeled with radioactive phosphorus are commercially available, but the phosphates in these segments can separate from the rest of the nucleotide during metabolism. To track each part of the nucleotide requires additional labeling approaches. Not only have Saljoughian and his colleagues devised a method for labeling specific bases, but they can place tritium atoms at particular positions on the base or independently at positions on the nucleotide's sugar. An added advantage is that the new phosphorylation technique allows the nucleotides to be tritiated at a very late step of synthesis -- avoiding the need to work with tritiated compounds at earlier stages. Saljoughian explains that they have adapted the method to a "mini-scale" procedure and modified it to synthesize a number of nucleotides, "including particular precursors of adenosine triphosphate (ATP) and deoxyadenosine triphosphate (dATP), which we can subsequently label with tritium." The process involves successive stages of drying, dissolving, stirring, adding other reagents and solutions, and drying again -- all in one "pot" -- until the compound is ready to be analyzed for purity. Saljoughian and Morimoto have also developed a method of monitoring the progress of phosphorylation using high-performance liquid chromatography, particularly useful since the rates of phosphorylation vary greatly between the various nucleosides, and reaction times have to be adjusted accordingly. In the first steps of the ATP or dATP labeling process, a bromine atom is attached to the base ring where the tritium atom will eventually be added. After a series of other steps, the triphosphate group is attached, and in the labeling step the bromine is removed in the presence of tritium gas and a catalyst, which substitutes tritium atoms at the desired positions in the molecule. The labeled nucleotide is then enzymatically or chemically incorporated into the desired DNA or RNA molecule. As an example of the research being done with tritiated nucleic acids, Saljoughian cites a collaboration with Scott Taylor of the Lab's Life Sciences Division to synthesize a sequence of the DNA aptamer for thrombin -- a factor essential in blood-clotting -- and attach the tritiated dATP nucleotide to its terminus. Thrombin plays an important role in arterial disease, and binding a specific, selective nucleic acid to a thrombin molecule is one way of putting it out of business. "The system is now being used to test the specificity of the aptamer for thrombin, as well as the stability of the bound system," Saljoughian says. Saljoughian explains that during the development of a novel labeling technique, any new procedure is first tested with ordinary hydrogen at a small scale, and if successful, with deuterium (the nonradioactive isotope of hydrogen with one neutron), to make sure that hydrogen does not sneak in from undesired sources. Only then is the process tried with tritium, using only about 10 percent of the tritium required for a compound with high specific activity. Only when the process is judged workable and safe is labeling conducted at full strength. Part of the National Tritium Labelling Facility's job is to pioneer techniques too difficult or too capital-intensive for universities and industry to handle alone. In addition to the tritiated nucleotides that Saljoughian and his colleagues have already synthesized, their new method should be useful for synthesizing many related compounds. The prospect of extending fundamental research further into the function and uses of nucleic acids powerfully motivates the efforts of Saljoughian, Morimoto, Williams, Chit Than, principal investigator David Wemmer, and the users and collaborators of the NTLF. For more information, visit the NTLF web site at http://www.lbl.gov/LBL-Programs/NTLF/. One of Berkeley Lab's own who went to Washington and became one of the U.S. Department of Energy's most respected managers will be honored on Thursday, Dec. 2, at an all-Laboratory reception in the cafeteria. Martha A. Krebs, who recently announced her resignation as director of the DOE's Office of Science, will come back to the Lab to say goodbye to her many friends, colleagues and acquaintances at the Lab. The brief program, to be held from 3:30 to 5:00 p.m., is scheduled to include tributes from Berkeley Lab Director Charles Shank, DOE Undersecretary Ernest Moniz, DOE-Oakland Manager James Turner, Oak Ridge National Laboratory Director Alvin Trivelpiece, and former Berkeley Lab Director David Shirley. Refreshments will be served and all employees are welcome. 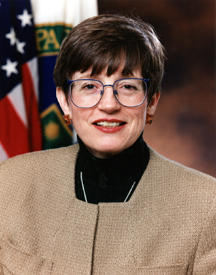 Krebs served as associate Laboratory director under Shirley and Shank from 1983 to 1993. She spent the following six years managing DOE's science and research budget in Washington. While at Berkeley, Krebs helped to shepherd several major projects through the developmental, funding and implementation phases, including the Advanced Light Source and the Genome Sciences Building. To recognize these and other efforts that advanced the cause of science at the Laboratory, a conference room in Building 84 will be named in her honor. The Clinton Administration is considering a plan to start a new National Nanotechnology Initiative that would create a multiagency program to accelerate the development of technologies capable of creating a new generation of nanoscale materials. Pat Dehmer, director of the Office of Basic Energy Sciences, told members of the Basic Energy Sciences Advisory Committee that the Administration will likely unveil a new program to improve nanotechnology research at DOE and other federal agencies. "Our challenge is to learn from Mother Nature how she uses the principle of nanotechnology to make sophisticated materials," Dehmer told the BESAC members. She also said the President's Committee of Advisors on Science and Technology will release a report later this month, to be sent to the President, recommending what role DOE and other agencies, including the National Science Foundation, should play in NNI. Dehmer expects DOE to know by the end of this month how much the Administration will seek for NNI in FY 2001, but is not saying what amount DOE is seeking for the initiative. The Office of Science will spend $47 million on nanotechnology R&D in FY 2000, a figure that does not include costs to operate facilities. A key concept behind nano-technology is what DOE calls "complex systems." This term refers to taking individual atoms from a substance and reconfiguring them to create new scientific properties. Berkeley Lab Director Charles Shank told BESAC that nanotechnology will have economic, as well as scientific, benefits for the United States. "Countries who understand the technology will be at an economic advantage in the future," Shank said. DOE has launched the Industry Interactive Procurement System, a website designed to help streamline procurements. Richard Hopf, director of DOE's Office of Procurement Services, called the new system "the primary way" DOE will conduct solicitations, receive bids, publicize clarifications and announce awards. Adam Arkin of the Physical Biosciences Division has received a TR100 Award, given by MIT Tech Review magazine for their choice of the 100 of the most innovative technologists/scientists for the new millennium. The ceremony was covered by MSNBC. In a study hailed as a "benchmark for all future papers in the area," Arkin created a computer model connecting the arrows of the genetic circuit which controls when a bacteriophage virus decides to begin reproducing. Arkin and Harley McAdams of Stanford have proved that the virus' decision is determined largely by chance chemical events. Arkin is expanding his research to create computer simulations that explain how genetic "switches" orchestrate the formation of our bodies. "Arkin's work foreshadows the biology of the next decades," the citation read, "when researchers begin to understand and control the cell's own circuitry." Governor Gray Davis recently signed a bill (SB 645) that will result in mandatory paycheck deductions for union-represented UC employees who do not currently pay union membership dues. At Berkeley Lab, seven groups of employees represented by five unions are being affected. The law, which goes into effect on Jan. 1, requires "agency shop" at the University of California and California State University. The legislation states that, "as a condition of continued employment," UC employees who are in a bargaining unit exclusively represented by a union must either join the union and pay its dues or pay a "fair share" fee to the union. The amount of the "fair share" fee will be determined by each of the university's unions, but shall not exceed the union's regular membership dues. The University of California opposed the union-sponsored measure, arguing that UC employees should have the opportunity to vote on any agency shop arrangement. The University is now committed to fulfilling its legal obligation to implement the new law and will be working with its unions on the details of implementation. According to the new law, the "fair share" deductions, if applicable, are to begin "upon notification to the employer by the exclusive representative," but no sooner than Jan. 1, 2000. UC will discuss the implementation timeline with each of its unions, and is currently examining the payroll processing changes necessary to implement the "fair share" deductions. Additional information will be provided as it becomes available. The law allows an employee "who is a member of a bona fide religion, body or sect that has historically held conscientious objections to joining or financially supporting public employee organizations" to instead pay an amount equivalent to the "fair share" fee to a "non-religious, non-labor charitable fund." The particular union and the university may designate a list of charitable funds to which conscientious objectors may direct their contribution. The "agency shop" arrangement may be rescinded by a majority vote of all employees in a bargaining unit. At least 30 percent of the employees in that unit must support a petition for such a vote. Any such election would be administered by the state Public Employment Relations Board. Employees who are unsure if they are affected by the law should contact their supervisor or local Office of Labor Relations. Questions about implementation, the "fair share"amount, or procedures for conscientous objectors should be directed to the union. Published twice a month by the Public Information Department for the employees and retirees of Ernest Orlando Lawrence Berkeley National Laboratory. Ron Kolb, PID department head. DOE Science Director Martha Krebs has told members of the Basic Energy Sciences Advisory Committee (BESAC) that she is concerned about the impact the recently created National Nuclear Security Administration will have on scientific collaborations between DOE's weapons and civilian labs. Congress created NNSA to run DOE's weapons programs under the FY 2000 defense authorization law in response to suspected Chinese espionage at the weapons labs. Krebs told BESAC members her office has not been consulted regarding how the new agency will operate. Under the NNSA plan, a new DOE under secretary for nuclear stewardship would serve as director of the agency. Because NNSA is considered semi-autonomous, the director would have the final say on what kind of projects, including those involving civilian labs, occur at the weapons labs. "Much of the successful research at the weapons labs resulted from collaborations with their non-defense counterparts," Krebs said, adding that the ability of the labs to work with one another has benefited them in many areas, including nuclear nonproliferation. She is unsure of how NNSA might affect future such collaborations. "If these collaborations are in any way diminished, the nation is less secure," she said. Since Krebs has announced her plans to leave her post in December, her successor will have to deal with the new NNSA structure. Energy Secretary Bill Richardson has yet to say who will be nominated to succeed her. Krebs expressed concerns to BESAC members over a number of other issues as well. For example, in the wake of alleged spying at the weapons labs, Congress and DOE have focused on improving computer security at all DOE facilities. While Krebs acknowledged the importance of protecting classified information, she said any improvements must be done in an orderly fashion. Otherwise, the department might wind up having a situation similar to earlier efforts to tighten environment, safety and health regulations. In the rush to address the safety issues, DOE made it more difficult to perform scientific research at the labs, Krebs said. "A lot of things happened that were mindless," she said of previous safety initiatives. Krebs also raised concerns about the severe cuts imposed by Congress on the amount of money contractors can spend on travel. The FY 2000 energy and water appropriations law would allow contractors to spend $150 million for these expenses -- $100 million less than what was spent in 1998. She also expressed worry over language in that same spending law that requires most labs to submit funding plans to the energy secretary by Dec. 31 each year. The plans, which require DOE approval, would include a list of programs and projects for the current fiscal year and the funds needed to fulfill them. Labs failing to complete the funding plan by Dec. 31 would not receive any more money, although the energy secretary would have the authority to provide exceptions to the provision. Krebs said this provision would diminish the amount of freedom the labs have to prioritize programs, and will instead shift much of that responsibility back to headquarters, and the chief financial officer. "The last thing we want to have happen is to have the chief financial officer running the labs," she said. Thomas H. Jukes, renowned biochemist, nutritionist, and molecular biologist in the Life Sciences Division, died on Nov. 2 after a brief illness. He was 93. 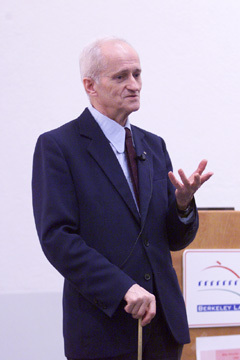 Jukes, an ardent supporter of biotechnology, was born in Hastings, England, and received his Ph.D. in biochemistry from the University of Toronto. In 1933 he moved to California and joined the UC faculty, where he and his colleagues did groundbreaking work involving the Vitamin B complex and the isolation of pantothenic acid. In 1942 Jukes joined Lederle Laboratories and directed chemical research in the agricultural division. During that period he also did pioneering work in chemo-therapy as a treatment for cancer. After the emerging importance of the genetic code in the early 1960s, Jukes transferred his scientific interests to molecular evolution and molecular biology. He also returned to Berkeley as a professor in residence of medical physics. He remained active on the Berkeley faculty until his death. Jukes is survived by his wife Marguerite Jukes, daughters Mavis Jukes and Caroline Knueppel, and seven grandchildren. A private interment was held at Sunset View Mortuary and Cemetery. The third annual J. M. Nitschke Memorial Day was celebrated on Wednesday with a morning lecture by Adam Sobiczewski, a visiting professor of nuclear physics from the Soltan Institute in Poland, and an afternoon ceremony honoring Fred Goulding, Robert Smolanczuk and Howard Wieman with awards for technical excellence. Albert Ghiorso presided over the events and related their history. Mike Nitschke was a highly respected experimentalist in the Nuclear Science Division who died of AIDs in 1995. 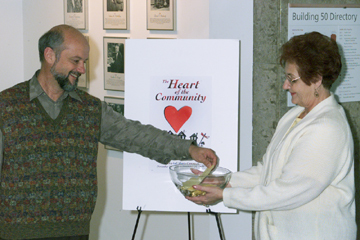 As executor of Nitschke's estate, Ghiorso established a memorial fund in his name, administered by the East Bay Community Foundation. "An informal committee gathers nominations and decides who will get the awards each year," Ghiorso explained. "We urge people to nominate deserving members of the Lab." Thus far the awards have been concentrated in the Nuclear Sciences Division, but Ghiorso seeks nominees with a record of outstanding technical service from all divisions. At his morning lecture on the structure and properties of superheavy nuclei, Sobiczweski talked about the newly extended understanding of the stability of superheavy elements, first proposed for elements in the so-called Island of Stability whose nuclear shells were spherical. But another group of relatively stable elements have been proposed whose shell structures, even though deformed, are also thought to confer relative stability; the island of stability now resembles an archipelago. At the afternoon awards ceremony, Fred Goulding was honored for his contributions to detector technology. He first visited the Lab in 1960 on a one-year sabbatical -- which stretched to 40 years. He and his colleagues first converted the Lab's vacuum-tube electronics to transistor technology, then went on to develop the silicon and germanium detectors which eventually led to the construction of the Gammasphere. He has designed and built many other devices for this Lab and others. Robert Smolanczuk was recognized for his guidance in the successful search for superheavy element 118, found at the 88-Inch Cyclotron earlier this year using his model of "cold fusion" reactions that emit only one neutron. Smolanczuk also calculated the decay chain of 118, through the new element 116 to element 114, that allowed unambiguous identification of the new elements. Howard Wieman was recognized for his numerous contributions to nuclear instrumentation, ranging from early beam lines and detectors, such as the Plastic Ball, through the first heavy-ion time projection chambers, to his direction of the construction, at Berkeley Lab, and now the operation of the STAR time projection chamber at the RHIC heavy-ion collider at Brookhaven. Each award winner was presented with a plaque and an envelope holding a promissory note. "It's a funny story about the money," Ghiorso explained wryly. "The Foundation was burglarized two days ago, so they had to destroy all the printed checks." The checks are in the mail, however, each for $3,000. Ghiorso and the Nitschke Awards committee emphasize that it's not too early to start sending in nominations for next year's awards. As Berkeley Lab SHARES enters the home stretch, employees who have not yet participated in the annual charity giving campaign are reminded to review their various donation options, either in their campaign packet or on the Internet at http://www.lbl.gov/shares/. The official campaign is scheduled to conclude on Wednesday, Nov. 24. However, donations will continue to be accepted through the following week, with the final prize drawing for donors set for Friday, Dec. 3. Employees who have not received donor forms may send an e-mail to [email protected] and request a packet of materials, which includes information on participating organizations and prize eligibility tickets. Prizes to be awarded in the final drawing will include lunch and dinner at local Berkeley restaurants, San Francisco Bay cruises, a night at a local hotel, T-shirts, place mats, and a free computer tune-up. All donors who have not won prizes in previous drawings will be eligible to win the final prizes. "It's a fun way to reward the generosity of our donors," campaign coordinator Ron Kolb said of the incentive prize program. "But the real reward is the realization that these gifts help agencies and individuals less fortunate than ourselves, or support scientific and educational causes on behalf of Berkeley Lab in the community. It's the quintessential definition of being a `good neighbor.'" Kolb said donations are running ahead of last year's pace and, with a strong finish, should establish a new record for Laboratory contributions to local charities. All donations are tax-deductible. One-time gifts by check will be applied to 1999 tax returns, while the payroll deduction option will take effect on Jan. 1 and will apply in tax year 2000. 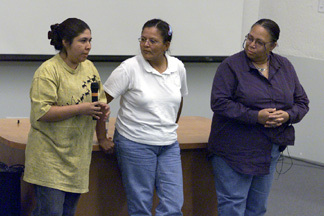 Corrina Gould (left), Johnella Sanchez and Gladys Cortez were the featured speakers at a forum held at Berkeley Lab on Nov. 9 in recognition of National American Indian Heritage Month. The event was sponsored by the Lab's Office of Workforce Diversity with assistance from the Latino and Native American Association (LANA). The speakers are co-founders of the Indian People Organizing for Change (IPOC), a new grass roots organization committed to building a stronger, more united Indian community. IPOC provides help with housing, health care, elder care, employment, and educational services to the Indian community in the Bay Area. Recent activities included an American Indians Veterans Forum, a health fair, a toy and food drive, and a job hotline. During the months of November and December LANA is helping with IPOC's toy and food drive. Lab employees interested in donating toys and canned goods may contact LANA co-chairs Rosa Rodriguez-Flores, [email protected] lbl.gov, or Claudia Quezada, [email protected] IPOC members may be reached at 523-5668. Also part of National American Indian Heritage Month activities was a showing of the critically acclaimed film "Smoke Signals" on Nov 5. The film is being shown again today at noon in the Bldg. 50 auditorium. Thursday, Dec. 16  3:00 - 4:30 p.m.
Thursday, Dec. 16, starting at 3:00 p.m. at the cafeteria. and lots of holiday spirit and good company. Everyone is invited. Mark your calendars and come join the fun. The LBNL Golf Club is hoping to attract new members in addition to renewals from regular members for the club's 2000 golfing season. The Golf Club holds tournaments once a month at courses throughout the Bay Area. Membership renewals are due by Nov. 30. Following is the schedule for the new season. For more information or to join, contact Denny Parra at X4598, [email protected] lbl.gov. A Fidelity Investments representative will provide half-hour consultations regarding investments and retirement plans on Dec. 1, Dec. 3 and Dec. 9. To sign up for a private session call Fidelity at (800) 642-7131 during regular business hours. All sessions will be held in the Bldg. 65 conference room. The Body Shop, Dec. 4, 12:00 -3:00 p.m. Discover how biomaterials can replace real body parts, do "replacement surgery" on fake bones, and experiment with real and fake biomaterials used for bone implants, heart valves, and skin adhesions. Starlight Stories with storyteller Mary Ellen Hill, Dec. 26, 1:00 p.m.
Magic, juggling, ventriloquism, and comedy acts with Magic Mike 2000, Dec. 27, 1:00 p.m.
Singer and storyteller Mara on the spirit of Chanukah, Christmas, and Kwanzaa, Dec. 28, 1:00 p.m.
Los Palomitos perform Latin American children's songs, Dec. 29, 1:00 p.m.
Snapdragon Puppet Productions presents The Mousecracker, Dec. 30, 1:00 p.m.
Millennium Project: Build your own time capsule out of containers and recycled building materials, Dec. 31, 12:00 -2:00 p.m. The Lawrence Hall of Science is open daily from 10:00 a.m. to 5:00 p.m.
For more information call 642-5132 or look up the LHS website at http://www.lhs.berkeley.edu. Adobe Photoshop and ImageReady will be the main topics to be discussed at the next meeting of the Macintosh Users Group (LBNL MUG), to be held Wednesday, Dec. 1 from 11:00 to 12:00 in Bldg. 90-3148. Other products will also be covered. The presentation is cross-platform so all interested employees are welcome. Larry Brusse of Computing Sciences' Networking and Telecommunications Department is retiring on Dec. 30 after more than 31 years at the Laboratory. Brusse's career here started in 1968 in the Electronics Group of the Engineering Department. 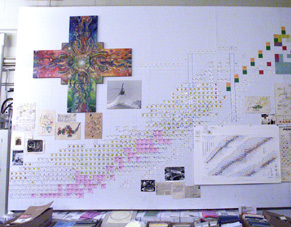 Later he worked with the Real Time Systems Group, at the 88-Inch Cyclotron and at the Bevatron. More recently Brusse has been responsible for the Outside Cable Plant, supporting the Lab's underground fiber optic and copper cable infrastructure for telephones and LBLnet systems. He and his wife Janet will move to Smith Valley, Nevada. A lunch will be held in his honor on Dec. 8 at Mexicali Rose near Jack London Square. To make your reservation, send a check for $15 to Charlene Stovall at MS 50E-101 by Dec. 7. For more information call Charlene at X6170 or Sig at X6713. After 20 years of service, John Randolph is leaving the Laboratory. A buffet luncheon to bid him farewell will be held on Monday, Dec. 13, in the Tartan Room of Hs Lordship's restaurant on the Berkeley Marina (199 Seawall Drive) starting at 11:30 a.m. The cost is $25 and covers the lunch and gift. For reservations, contact Learr English at X6303 or [email protected] RSVP by Tuesday, Nov. 30. AMERICAN INDIAN HERITAGE MONTH FILM SHOWING: "SMOKE SIGNALS"
Bldg. 65 conference room. Call (800) 642-7131 for appointment. Dance classes are held every Monday from noon to 1:00 on the lower level of Bldg. 51, with practices on Wednesdays at noon. Martial arts classes are held every Monday and Wednesday from 5:00 to 6:15 p.m. at the same location. "Doping the Mott Insulators" will be presented by Professor Zhi-Xun Shen of Stanford University. "How to Get More Structure in Structural Biology" will be presented by Gerry McDermott of Physical Biosciences. "Hormones, Aneuploidy and p53 Tumor Suppressor Gene Function in a Mammary Gland Specific Mouse Model" will be presented by Daniel Medina of Baylor College of Medicine, Houston, Texas. "Death, Arrest and Repair: Cellular Responses to Ionizing Radiation" will be presented by Steven A. Leadon of the University of North Carolina, Chapel Hill. Items for the calendars may be sent via e-mail to [email protected] lbl.gov, faxed to X6641, or mailed to Bldg. 65B. The deadline for the Dec. 3 issue is 5 p.m. Monday, Nov. 29. Below are the top three finishers in last month's Runaround, broken down by age group, with the time and overall placement. Classes are held in Bldg. 51L. For more information on AIM training or registration procedure, look up the class website at http://www.lbl.gov/Workplace/EDT/computers/PC_Classes.html or contact Heather Pinto at X4181. Ads are accepted only from LBNL employees, retirees, and on-site DOE personnel. Only items of your own personal property may be offered for sale. Submissions must include name, affiliation, extension, and home telephone number. Ads must be submitted in writing--via e-mail ([email protected]), fax (X6641), or delivered/ mailed to Bldg. 65B. No ads will be taken by phone. Ads will run one issue only unless resubmitted in writing. They will be repeated only as space permits. The deadline for the Dec. 3 issue is Friday, Nov 26.